» 582 Fresh Pipes » 78 Other Arrivals » Subscribe FREE Shipping on all US orders over $95 | When Will My Package Ship? 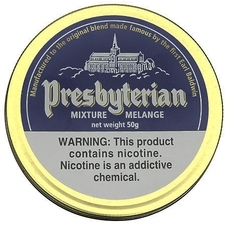 Presbyterian is one of those unusual cases of a blend that stands alone, both by being unique and by being the only blend under its brand - which is technically William P. Solomon, in actuality. This light-on-the-Latakia mixture was originally the creation of tobacconist Alfred Gale Sr., for a customer by the name of John White, a minister of the Church of Scotland. The unique, mellow blend would likely have been lost to history, had it not been introduced to, and become a favorite of British Prime Minister Stanley Baldwin.